In the two previous interiors I showed you over, my favorite details were the iconic Eames chairs. I cannot give you a rational reason why these design classic pieces are so close to my heart, but they are, indeed. Charles and Ray Eames, a truly great husband-and-wife design team – maybe the best ever – designed dozens of fantastic pieces in the 40’s and 50’s. They contributed remarkably to the field of architecture, exhibition design, graphic design, toy design, and films as well, but people identify them mostly with their outstanding, unmistakable furnitures. Finnish American Eero Saarinen (1910- 1961) is one of the most famous architects and industrial designers of the 20th century. The simple, sweeping, arching structural curves characterizing his pieces cannot be mistaken for anything else. Even though he was a great architect as well, Saarinen is mostly known for his iconic furnitures. The most popular ones were “Womb” chair and ottoman (from 1948), the “Womb” settee (from 1950), side- and armchairs (from 1948–1950), and of course the “Tulip” or “Pedestal” group (from 1956), which featured side- and armchairs, dining, coffee and side tables, as well as stool. All of his chairs are produced by Knoll furniture company, founded by Hans Knoll (who married by the way Saarinen family friend Florence (Schust) Knoll). When I found those nice Saarinen redo-s on Chairloom’s website while writing the previous post (see the image below) I knew I would dedicate this post to him, because I admire his oeuvre so much. Hanne and Søren Berzant’s home near Copenhagen has always been a perfect example of Nordic aesthetics. Their 280 m2 turn-of-the-century apartment was refined, simple yet luxorious, bright and airy, the dominant colours, textures and materials were all natural. All the rooms were tastefully decorated with a Scandinavian touch of course. 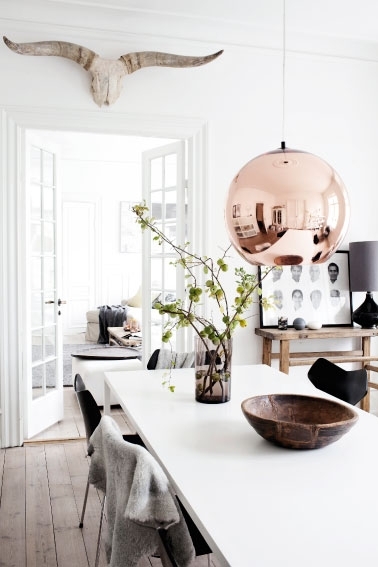 She and her family has recently moved to a villa in the north of Copenhagen and even though you can feel it is not 100% ready yet, the designer’s excellent taste has already appeared in every corner. Hanne is a designer and owner of a gorgeous Danish brand By Nord so no surprise we can always find quite some strategically placed By Nord products around their house.